BBC News – Is the US in denial over its $14tn debt? Quote:"The evidence is overwhelming that college is a better investment for most graduates than in the past. A new study even shows that a bachelor’s degree pays off for jobs that don’t require one: secretaries, plumbers and cashiers. And, beyond money, education seems to make people happier and healthier. “Sending more young Americans to college is not a panacea,” says David Autor, an M.I.T. economist who studies the labor market. “Not sending them to college would be a disaster.” "
// I wonder if they controlled for all the variables, as there's no a priori reason to pay a college educated dishwasher more than one without a degree. My guess is it's an urban/rural thing. People in cities make more than rural dwellers, people in cities are more likely to have an education. But I would love to get my hands on that study. Quote:"the answer to robust growth is to remove the barriers to economic activity that create a wedge between work and reward. For individuals to prosper, the ideal scenario is one where taxes, or the price put on their production is low, regulations that inhibit their production light, trade that allows them to exchange their production for that of others largely free, and a stable currency that allows producers and investors to assign credible value to economic activity. // I'm torn. I like the idea as it will bring Canada closer to the Royals. But the backlash would be just as strong as the benefit. Quote:"A federal indictment states that Dawkins started to fill out a passport application in 2004, didn't complete it, then filled out a new application two years later. On that new application, he checked a box "no" for the question, "Have you ever applied before?" according to the indictment. Dawkins got the passport, but three months ago, the government issued a warrant for his arrest. He was taking photos for the Navy at the time. When Dawkins got back to the U.S. in April, he was arrested about a week later and has been in jail for two months since." // That's the stupidest thing I've read today. And I read a lot of stupid. Luckily, this guy has a US Senator getting involved, which is a good thing. // People keep saying things are getting better, but what is that based on? Look at workforce participation as a % of population and you'll see things are worse. Quote:"One-third of the millionaires have disappeared from Maryland tax rolls. In 2008 roughly 3,000 million-dollar income tax returns were filed by the end of April. This year there were 2,000, which the state comptroller's office concedes is a "substantial decline." On those missing returns, the government collects 6.25% of nothing. Instead of the state coffers gaining the extra $106 million the politicians predicted, millionaires paid $100 million less in taxes than they did last year — even at higher rates. // I prefer my stupidity with a martini. -The Book is coming. When it does I’m sure you won’t hear the end of it from me. -I’ve had lots of discussion recently with many people (mostly on Facebook) about raising the top income tax bracket rate “just a little bit”, a “trivial amount”, so the deficits will go down and the economy recovers. [And the argument that higher top income tax brackets leads to a better economy has become pervasive, but that’s a different blog post]. It is annoying to hear the “little tax increase” argument, as people are suggesting a tiny increase would be meaningless. If that’s the case, then why do it? If it’s a trivial amount up, then it’s a trivial amount down. The reply to this is, of course, that a little from a lot is a lot. Fine, if the tiny tax increase has a large effect on the deficit, then the tiny increase could be said to have a large effect on the economy. The “littleness” argument goes both ways, that’s my point. -Many Twins bloggers I read are talking about how far away from .500 the Twins are. At one point, they were ten games below .500 but only 6.5 games back. Worrying about some arbitrary number is incorrect reasoning. The only thing worth worrying (or thinking, or talking) about is beating the teams in front of you. The Twins, despite the recent setbacks, have a lot of opportunity to make up some ground in the AL Central race. They have a lot of home games against their Central Division opponents. If the June Twins team is for real, then the Twins can make a legitimate playoff run. -Operation Bullpen by Kevin Nelson. This book is about the large undercover FBI investigation of a forgery ring in the 1990’s. The items being forged were autographs, almost all of them done by a man named Greg Marino. If you bought an autographed baseball online in the 1990’s, you probably have a piece of Operation Bullpen in your home (at least two baseballs in my family are from the Marino forgery ring). The book was really good, though sometimes Mr. Nelson writes as if he forgot how, but most of the time it’s okay (Mr. Nelson is a journalist, so writing well is not his forte). 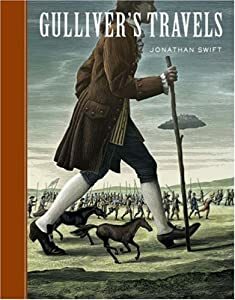 -Gulliver’s Travels by Jonathan Swift. This is another selection from the Great Books of the Western World Ten-Year reading list. Most people are familiar with the Lilliputians and the giants (Brobdingnagians) that are featured prominently and frequently in popular culture. But there is so much more to Gulliver’s Travels. There are scathing satirizations of lawyers and academics and harsh criticisms of the human race in general. In the final book, Voyage to the Houyhnhnms, Swift lets us know we are all brutish animals. And it’s hard to argue with his conclusion. It’s just another book everyone should read. -SEAL Team Six by Howard Wasdin. Wasdin was a sniper for SEAL Team Six and got shot up real bad in the Battle of Mogadishu. His co-author/ghost-writer Stephen Templin does an incredible job creating a fast-moving narrative that gets to point. It is unlike most of the other autobios of SEALs I’ve read; it does not dwell too long on the SEAL training (which anyone who reads military memoirs regularly already understands is incredibly torturous) and there’s not a lot of narcissism (in fact, one of the lessons from the book is Wasdin’s realization that he’s not an ubermensch). It did not take long to read this book, and anyone interested in the subject matter should pick it up. -151 Best Movies You’ve Never Seen by Leonard Maltin. I didn’t actually read the whole book. I read a 32 part selection available for free on Dailylit.com. I was debating whether to get the book, and based on the 20% of it I’ve read so far, I’m going to pass. Maltin is obsessed with celebrity, instead of performance. (There were other weaknesses in his reasoning that just turned me off.) While I had not seen many of the films on the list, those I did see I would not put into a list of the “best”-anything. Maltin certainly did not convince me to venture out to see any of the movies in the selection. Quote: "Initial claims for state unemployment benefits climbed 9,000 to 429,000, the Labor Department said Thursday. Economists had expected claims to come in at 415,000. // Seriously, who are these economists? I can be just as wrong as them, give me a job. Quote:"Dr Jens Pruessner of the Douglas Mental Health University Institute in Quebec, who helped carry out the study, said: ‘Previous findings have shown that the risk for anxiety disorders is 21 per cent higher for people from the city, who also have a 39 per cent increase for mood disorders. Dr Pruessner and colleagues from the Univerity of Heidleberg in Germany monitored the brain activity of adult volunteers while they carried out mental arithmetic puzzles under time pressure. The functional magnetic resonance imaging scans revealed that the brains of those living in cities reacted differently to stress, the researchers report in the journal Nature. // Specifically, the amygdala is the problem area for urbanites. Quote:"U.S. state and local governments will need to raise taxes by $1,398 per household every year for the next 30 years if they are to fully fund their pension systems, a study released on Wednesday said. Rauh and Novy-Marx have previously stirred up the debate over state pension obligations, including the dire prediction that existing pension liabilities total around $3 trillion, if expected returns on investments are not counted. Other studies have estimated the shortfall as far less. The Pew Center on the States, for example, found the pension shortfall for states could be $1.8 trillion, or as much as $2.4 trillion based on a 30-year Treasury bond." // I'm sure raising the income tax will solve this. Certain. Quote:"The final health-care costs for someone who dies at 100 are typically about one-third of the costs for someone who dies at 67, says Nir Barzilai, director of the Institute for Aging Research at Albert Einstein College of Medicine of Yeshiva University in New York. People who live so long tend to be healthier and more likely to die from a problem quickly, Dr. Barzilai says." // That seems cosmically unfair to me. Quote:"President Barack Obama's health care law would let several million middle-class people get nearly free insurance meant for the poor, a twist government number crunchers say they discovered only after the complex bill was signed. // It's the rubber gasket on the machines that harbor some nasty fungi. Quote:"Fourteen states are facing 2010 budget gaps that exceed 20 percent of their G.D.P. ; only two went for John McCain. (Strikingly, they’re McCain’s own Arizona and Sarah Palin’s Alaska.) Of the nine states that have raised taxes this year, closing deficits at the expense of growth, almost all are liberal bastions. The urban scholar Joel Kotkin has called this recession a blue-state “meltdown.” That overstates the case: The Deep South has been hit hard by unemployment, and some liberal regions are weathering the storm reasonably well. And clearly part of the blame for the current crisis rests with decisions made in George W. Bush’s Washington. But in state capital after state capital, the downturn has highlighted the weaknesses of liberal governance — the zeal for unsustainable social spending, the preference for regulation over job creation, the heavy reliance for tax revenue on the volatile incomes of the upper upper class. "We have to account for the fact that the ocean basins are actually getting slightly bigger… water volume is expanding," he said, a phenomenon they call glacial isostatic adjustment (GIA)."